I should really keep this quiet. I mean, someone sensible would, but I am incorrigible when it comes to a joyful discovery. I have in my possession the perfect bottle – or four as I begged Clangers to clear out the shelves at Aldi – a necessary step to take when the gold of the perfect bottle of unlabelled wine is discovered. Such joy – there are no words, but if you want to share the moment and can beat me to clearing out what remains of the loot – I can point you in the direction of Aldi but will say no more on the subject. On the subject of Pumpkins, I have more to say. 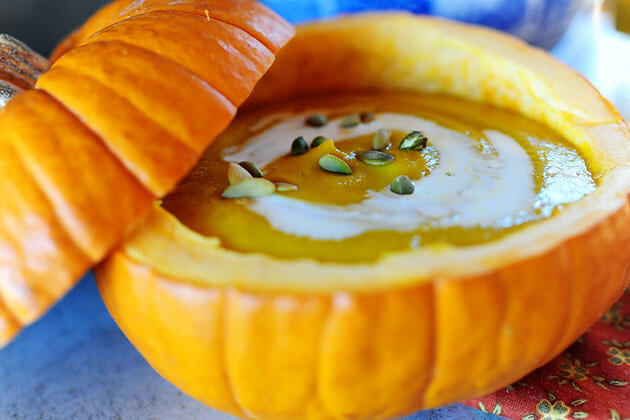 Pumpkin Soup is the hidden joy of winter nights but a small amount of alchemical transformation is required to extract the joy. Chicken Stock – the real stuff, is necessary. To begin roast the pumpkins, onions and garlic – caramelizes all three – the way nature intended sugar to be. Next grate some ginger and fry in butter together with a hefty wop of cumin and coriander. Next bung in the pumpkin, onions, garlic and chicken stock and bring to boil. Then blitz with bartender’s friend to silken texture, add cream and fresh green coriander on top maybe some pepper – and fill up a wine glass with the loot from Aldi. Let us say – no more. Good Times. ← Gnomes United! Will never be Defeated! Burger Off!